As expected, At September 9, 2014 Media Press Event, Apple announced its two next-generation iPhone models called; iPhone 6 (4.7-inch model) and iPhone 6 Plus (5.5-inch model) and also Apple's first ever Smartwatch called; Apple Watch, and the best part is all of these newest Apple devices are powered by iOS 8 Final Golden Master (Build: 12A365) Firmware. Users can instantly Download iOS 8 Final GM IPSW Firmware for iPhone 6, iPhone 6 Plus, iPhone 5S, iPhone 5C, iPhone 5, iPhone 4S, iPod Touch 5G, iPad Air 5G, iPad 4G, iPad Mini, iPad Mini 2, iPad 3G, iPad 2G and Apple TV 3G via Direct Links available below. Apple iOS 8 Final GM Firmware for iPhone, iPad, iPod Touch and Apple TV 3G has been officially released today i.e. September 17th, 2014 to general public users worldwide. iOS 8 Final Official Version (Build: 12A365) is available to all iOS developers and iOS non-developers (general users) for standalone download, install, update / upgrade to iOS 8 Final update officially via iTunes and as well as via Over-the-Air (OTA) wireless process by Apple. 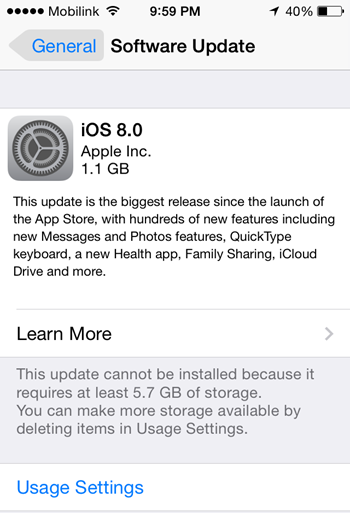 What's New in iOS 8 Firmware Features & Changes? The official iOS 8 Final Golden Master (Build: 12A365) Firmware Update changelog contains several new changes in functionalities and features, such as; support for third-party keyboards, all-new widgets, interactive notifications, all-new Messages app, system software performance improvements, enhancements, stability issues fixation, bug fixes etc. Apple has also seeded and updated other software platforms as well i.e. Apple TV 7.0 Final GM (Build: 12A365b) Software, Xcode 6 Final GM (Build: 6A313), Xcode 6.1 Beta (Build: 6A1027), Command Line Tools and iTunes 11.4 with support for iOS 8 syncing for Mac OS X and Windows operating systems. How to Manually Download iOS 8 Firmware? Apple device users can update / upgrade to iOS 8 Final GM Firmware via OTA (Over-the-Air) wireless process by going to; Settings > General > Software Update option under settings tab. If you're registered iOS developer, then you can visit iOS Dev Center website for official iOS 8 Final GM (Build: 12A365) Downloads, and if you're non-registered non-developer (general public user), then you can manually download, install and activate iOS 8 Final GM without Apple UDID and without iOS Developer account via iTunes, after getting the Direct Download Links of iOS 8 Final GM Firmware IPSW File for iPhone 6, iPhone 6 Plus, iPhone 5S, iPhone 5C, iPhone 5, iPhone 4S, iPod Touch 5G, iPad Air 5G, iPad 4G, iPad Mini, iPad Mini 2, iPad 3G, iPad 2G and Apple TV 3G as mentioned below. For All iOS 8 Jailbreakers! No untethered iOS 8 Final GM Jailbreak is available from "Pangu" (Pangu iOS 8 Jailbreak Tool) or from "evad3rs" (Evasi0n8 Jailbreak Tool). You cannot downgrade from Latest iOS 8 Final Firmware to Old iOS 7.1.x Firmware versions. How to Manually Install iOS 8 Firmware via iTunes? Step 2: Start iTunes on Mac OS X or Windows and connect your Apple iDevice via USB data cable. Step 3: Now, Select your respective device from the left navigation panel on iTunes Software. Step 4: After that, Hold down the Shift button (on Windows) or Alt/Option button (on Mac) and press the "Restore" button on iTunes Software. Step 5: Now, Browse and select the downloaded iOS 8 Final IPSW firmware file, and Let the restore process gets completed. Congratulations!! You're done! !